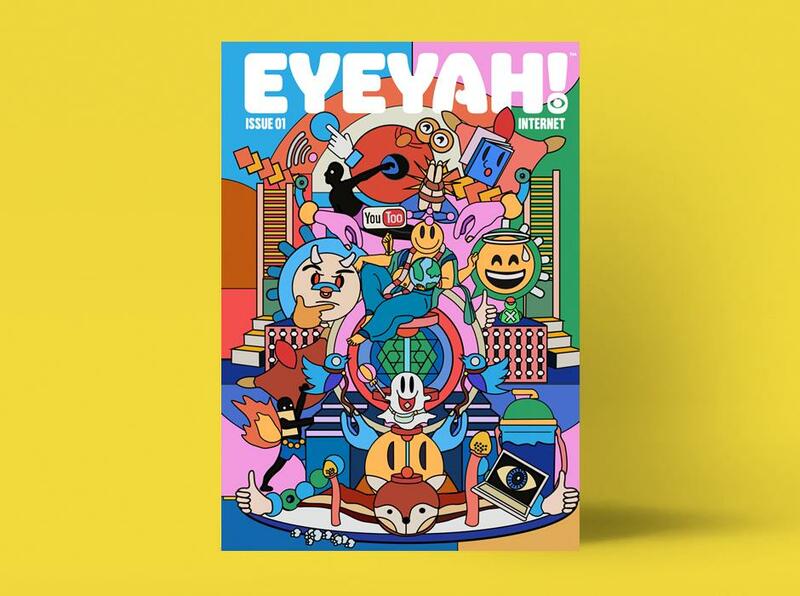 Cool new art project/magazine from Singapore: EYEYAH! While it sure is a sight to behold, there’s much more to this magazine than meets the eye. I met Steve and Tanya, the duo at the top of the Singapore counterculture scene best known for curating Kult, the top local alternative art magazine and galley, and learned more about EYEYAH! Their new initiative aims to leverage their global network of 1000 plus artists to produce engaging multimedia content, events, and social campaigns to “inspire children, changing perceptions and provoking new points of view”. Their flagship creation, EYEYAH! Magazine, was launched this January. The first issue brings together interactive artwork, launches a social campaign for kids to contribute their own pieces, and comes with six visceral stickers. It kicks off with the below invitation where the authors rightly proclaim the magazine to be the “Hitch-Hikers Guide to the Wild Wild Web” and overall does a kickass job of teaching kids about the Internet. Though they just launched the first issue in January, selected pages are already being distributed to local schools in a black and white zine format, spicing up education about the Internet in participating local schools. While the magazine and curriculum are currently only available in Singapore, there are plans for a global launch later this year (which I am helping their team with). For now, you can check out their website to learn more about the magazines, prints, and tees they have to offer.